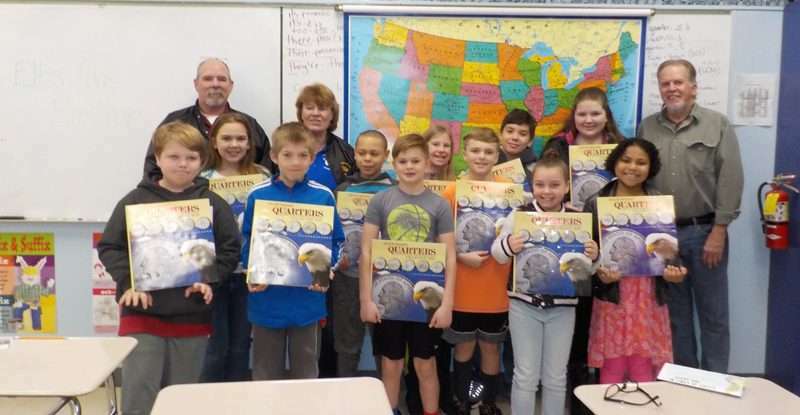 Fifth-graders at Fletcher Walker Elementary in Westwood were looking forward to receiving the Statehood Quarter Albums distributed annually by the Lake Almanor Elks. On Wednesday, Jan. 30, three members came to their classroom to present the albums. They were Kathy and Bud Wasson and Jack Forester. As part of a split-grade class, last year in fourth grade, the students became aware of what was instore, said Eileen Heisig, their teacher. Kathy Wasson said the albums make geography fun and that is one reason they give them out. The fifth-graders had fun answering questions posed by the presenters. Two students each received a quarter for naming Tennessee and Missouri. Another question was where in the United States do four states touch? The answer is Arizona, New Mexico, Colorado and Utah and the location is known as the “Four Corners.” At this location people can stand in four states at one time. In addition to receiving a quarter for correct answers to questions, all students received four quarters to start their coin collection to fill their album. The U.S. Mint began printing quarters that featured a state in 1999, creating five different state quarters a year. The project was finished in 2008. Quarters were printed in the order the state ratified the Constitution or was admitted into the Union. Therefore, the first five states to have a commemorative quarter were Delaware, Pennsylvania, New Jersey, Georgia and Connecticut. The state designs are on the “tails” side of the quarter. California was the 31st quarter printed by the United States Mint, admitted to the Union in 1850. The design features John Muir, a naturalist and conservationist, Half Dome in Yosemite Valley and a California condor. The albums also have a place for the quarters that represent United States territories, which are the District of Columbia, Puerto Rico, Guam, American Samoa, U.S. Virgin Islands and the Northern Mariana Islands. The Elks encouraged the students to collect quarters and trade in order to fill their map. The quarter albums are an example of the good works Lake Almanor Elks do throughout the community. Students were told the Elks motto is “Elks Care, Elks Share.” Other work within schools includes the distribution of dictionaries to third-graders and college scholarships given to graduating seniors.